Unfortunately for the country's cardiovascular health, the east coast has no use for bikes, the south has no use for walking, and the American commute is still dominated by cars. Maybe it's the high price of gas. Or the bougie obsession with healthy living. Or the emerging understanding that sitting in a car for an hour a day is literally killing you right now. Whatever it is, Americans are 60 percent more likely to bike to work than a decade ago, according to new Census figures. About 800,000 workers pedal to the office every day. That sounds like a lot, compared to, say, the 40,000 people who take a ferry to work (true fact). But it's a pittance next to the 120 million workers who still prefer the gas pedal of their car. The city most likely to bike? It's Portland, Oregon. In fact, the midwest and northwest dominates the top ten, which lacks any city from the northeast or the south. Interestingly: Workers in Los Angeles are more likely to bike to the office than workers in New York City. In fact, at 0.8 percent, NYCers are as (un)likely to bike to work as Atlanta workers. Since this data was collected across 2008-2012, it misses, but also explains the challenges of, the introduction of Citi Bike to the city. There's an even cheaper way to commute without a car, and that's walking. On this measure, the east coast dominates the top ten. 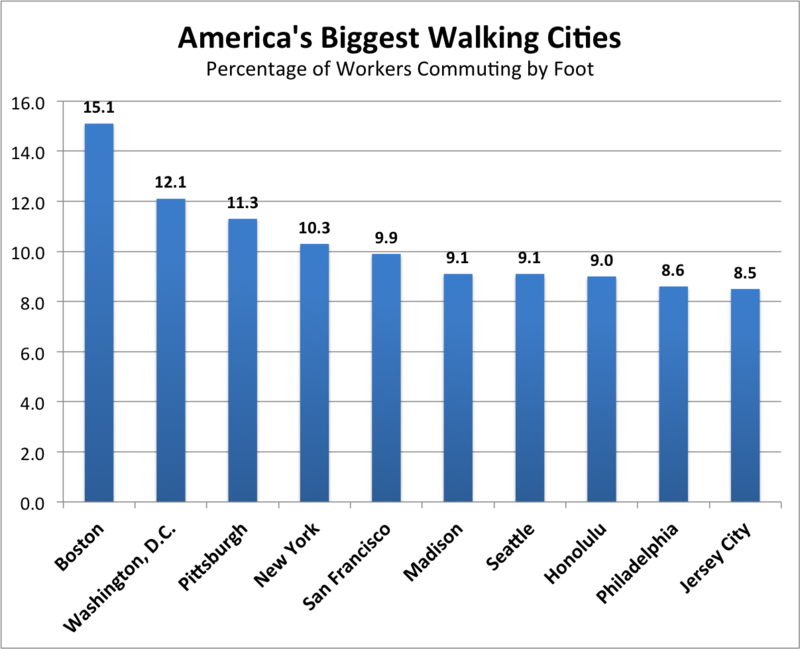 Although Americans are still much more likely to walk to work than bike, the ranks of walking commuters aren't growing. In fact, Americans are about half as likely to walk to work as we were in the 1980s: the national rate has fallen from 5.6 percent to around 3 percent. 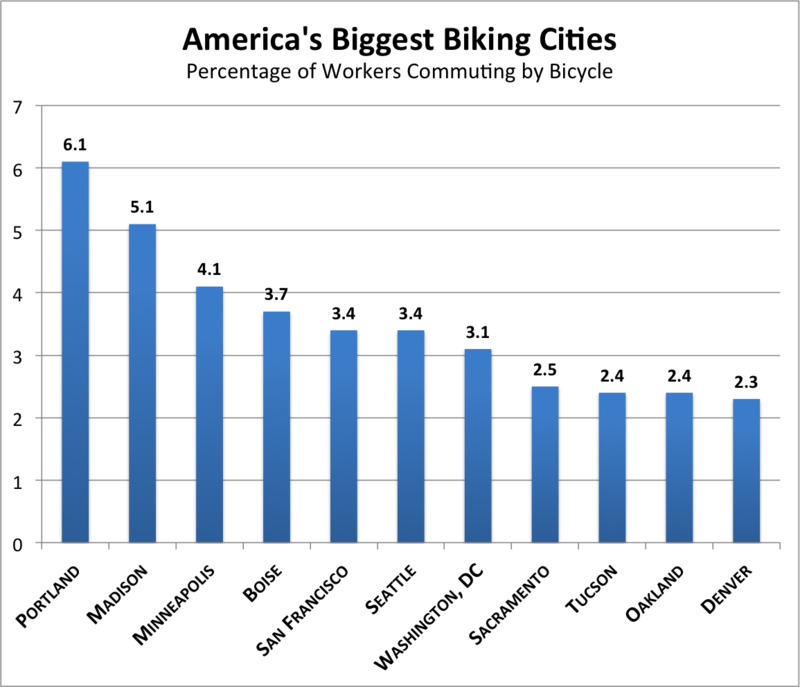 And the cities with the highest concentration of walkers and bikers combined? That would be Boston, Washington, D.C., and Madison. Finishing in the bottom 20 in both categories were Montgomery, Alabama, Laredo and Garland, Texas, and Chesapeake, Virginia. 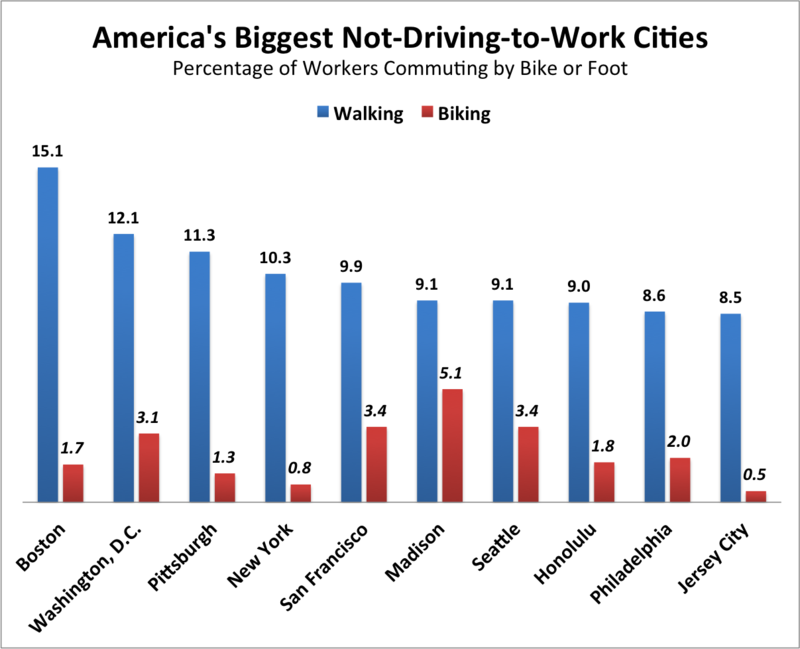 The strangest discrepancy: Newark finished in the top 15 in walking to work and in the bottom 20 for biking to work. 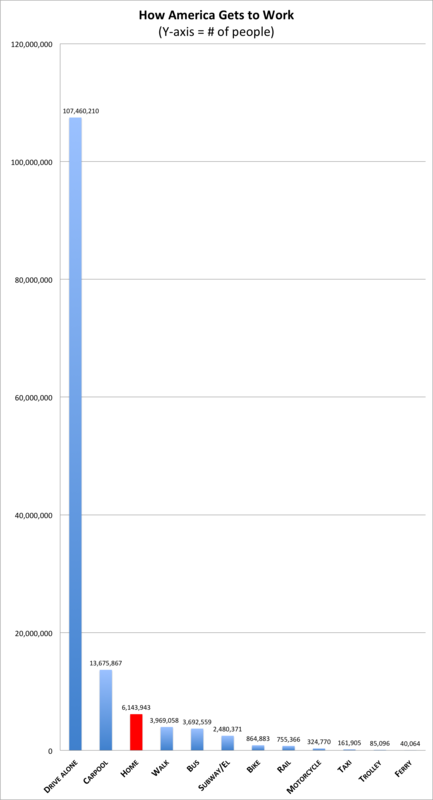 The big picture, though, is that that more than eight in ten people still drive to work (and mostly alone).